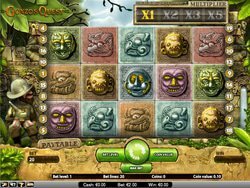 The Thor movie slot machine lets players enter the world of this loved and cherished character thanks to the software provider known as Playtech. The company currently owns the exclusive rights to produce titles based upon Marvel superheroes. This is a part of the progressive jackpot network and it is based on the blockbuster movie of the same name. While there are several releases on the internet, Playtech's version is the only one that is licensed. For this reason, it offers the best audio and graphics out of all of those that are currently on the market. There's no denying that this title is tons of fun, It offers five reels and 30 paylines which is similar to the rest of the Marvel themed slots. The coin denomination range is from $0.01 to $20. This makes the minimum amount a person can bet $0.01 and the maximum bet $600. The main icons are all recognizable as many of the characters from the movie make an appearance and there is also actual footage incorporated into the action. Most of the smaller icons are made up of high playing cards 9 through Ace. Thor's Hammer represents the scatter symbol and when three, four or five hammers appear on the reels, there is a payout of five, 25, or 100 coins. When Thor covers the entire second reel, the Thunderstorm re-spin is offered during which the second reel is locked and remains wild. Unfortunately, this feature cannot be retriggered at any time as it is progressing. When he covers the fourth reel, the Lightning free spins will occur. Players are given a free spin where anywhere from two to five wilds will be placed on the screen at random. Another option is called the Earth round. This awards free spins during which multipliers will appear at random. "Jotunheim" free spins are awarded when one of the movie characters appears on all of the reels. These are just a few of the fun features of the Thor movie slot machine.